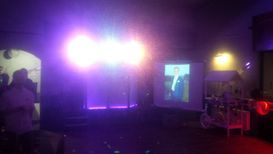 Add a large 80" projection screen to show photos or a presentation for just £50.00. Price includes an Ultra Short Throw Projector, screen and use of my laptop. All that is required are the photos on a memory stick, SD card or CD/DVD and I will take care of the rest. Upgrade your booking with the worlds shortest throw projector and a 80" rear projection popup screen. The projector and screen takes up only a small amount of space which makes it suitable even for the smallest of rooms, the screen is a pull up screen, erected in seconds with the utra short throw projector sitting on it's case at the foot of the screen projecting a large 80" image for all to see. A favorite for birthdays with baby and toddler photos as well as any other special photos being projected onto the screen. Ideal for post wedding celebrations to show off your wedding photos during the evening. It's so easy to add this to your booking, either ring me on 07706 1524 69, e-mail me on info@gngentertainment.org or simply complete the contact me form below and I will be in touch as soon as possible.